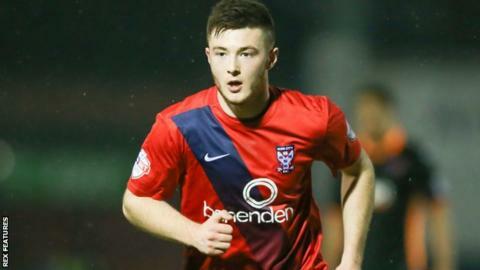 Loanee Bradley Fewster's double moved York City out of the relegation zone with victory over Exeter City. The striker picked up Michael Coulson's pass and fired in a low shot from close range to give the Minstermen the lead. Jayden Stockley came close to equalising for the visitors minutes later but his header hit the cross bar. Fewster won a scramble on the edge of the box to double York's lead after the break, as the home side registered back-to-back victories. "I thought it was a hard work performance. They caused us problems. They're a good side. "But I'm delighted with all three points, the two goals and the clean sheet. It gives the defence a lot of confidence. "We can play a lot better but credit to the way Exeter played the game." Match ends, York City 2, Exeter City 0. Second Half ends, York City 2, Exeter City 0. Derek Riordan (York City) wins a free kick in the attacking half. Foul by Kyle Cameron (York City). Josh Carson (York City) wins a free kick on the left wing. Foul by Jordan Moore-Taylor (Exeter City). Substitution, York City. Josh Carson replaces Michael Coulson. Foul by Bradley Fewster (York City). Troy Brown (Exeter City) wins a free kick in the attacking half. Substitution, York City. Derek Riordan replaces Kenneth McEvoy. Attempt missed. Jake Taylor (Exeter City) left footed shot from the centre of the box is close, but misses to the right. Substitution, Exeter City. Alex Nicholls replaces Ryan Harley. Attempt missed. Lee Holmes (Exeter City) right footed shot from the centre of the box is close, but misses to the right. Substitution, Exeter City. Jamie McAllister replaces Christian Ribeiro because of an injury. Delay in match (Exeter City). Corner, York City. Conceded by Christian Ribeiro. Attempt saved. Michael Coulson (York City) left footed shot from the centre of the box is saved in the bottom right corner. Corner, York City. Conceded by Robert Olejnik. Kenneth McEvoy (York City) wins a free kick in the defensive half. Substitution, Exeter City. Clinton Morrison replaces Matt Oakley. Goal! York City 2, Exeter City 0. Bradley Fewster (York City) right footed shot from the centre of the box to the bottom left corner. Assisted by Kenneth McEvoy. Attempt saved. Tom McCready (Exeter City) right footed shot from more than 40 yards on the right wing is saved in the top left corner. Jordan Moore-Taylor (Exeter City) wins a free kick in the attacking half. Foul by Michael Coulson (York City). Corner, Exeter City. Conceded by Lubomir Satka. Substitution, York City. Luke Summerfield replaces Jake Hyde. Foul by James Berrett (York City). Jordan Tillson (Exeter City) wins a free kick in the defensive half. Russell Penn (York City) wins a free kick in the attacking half. Foul by Jake Hyde (York City). Tom McCready (Exeter City) wins a free kick in the attacking half.